One of the resolutions I made after the Counter Jihad workshop in Vienna was to write more frequently about Spanish issues in English. I had already done it a few times for Gates of Vienna; I will continue to do so as long as the Baron deems my contribution valuable. I am also open to the requests by the readers. I was asked in the las Counter Yihad workshop in Vienna about the project to connect Morocco and Spain by a tunnel. I had read and blogged about this issue some time ago but I had not followed the latest developments. I have now investigated them, and I have found that the project goes on –still as a project in the study phase- but unchallenged. I present to you the results of my investigation. I will start with a curiosity. The idea of connecting both continents with a tunnel is not new. I have found an early speculation, a proposal to the Spanish Ministerio de Fomento (Ministry of Civil Works) (PDF, Spanish), dated 1918, when the north of Morocco was a Spanish Protectorate. The first studies (PDF, Spanish) of the project were done during the Primo de Rivera Dictatorship. In those days, the tunnel was considered a geo-strategic opportunity for Spain. It goes without saying that, in the current demographical situation, it would aggravate the Northafrican invasion of Spain, the second in history. Yes, it is not the economy, it is the demography! 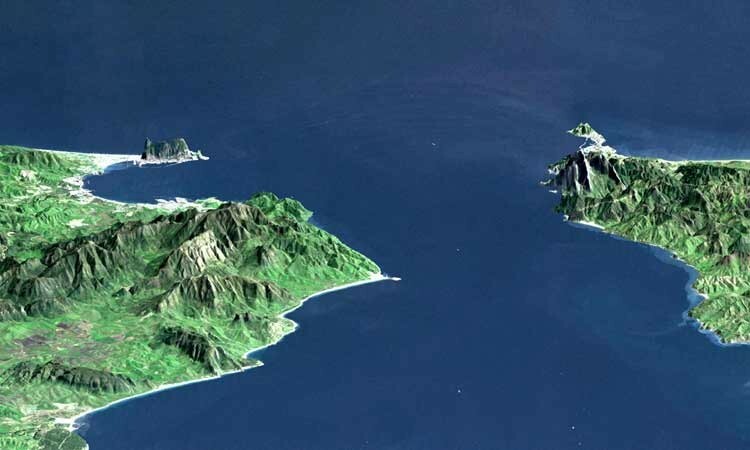 The idea was forgotten up until 1980, when Spain and Morocco signed an agreement to study the feasibility of a “Permanent Connection Europe-Africa through the Gibraltar Strait”. In those days Spain had just approved the post-Franco Constitution and was ruled by a “moderate right”. It may be worth mentioning that five years before, when Franco was dying, Morocco invaded the Sahara, a colonial province of Spain, which is still the responsible State for the territory according to “international law”. I find strage that a State makes such agreement with another one that has occupied part of its territory, but that is not the topic today. There were a number of studies (Spanish), which discarded the bridge and identified two possibilities for the tunnel. One shorter (14 Km) but deeper (900 m); the other, longer (28 Km) but less deep (400 m). The possibility to build a bridge was discarded. In the 80s and 90s, the studies stayed dormant, but in 2003 (at the end of Aznar´s government) the idea was waked up again. Spain and Morocco agreed to start the technical studies to build a double railway tunnel with an intermediate service and maintenance tunnel. They agreed to spend 27 million euros in years 2004 to 2006. For some reason, it was not done. In March 2004, Spain had suffered the most deadly terrorist attack of its history, carried out by Moroccan citizens -if we are to believe the official version-. I assume that this could be the main reason. According to the [Spanish] minister, the railway tunnel will be funded 50% by the two countries. “We have conducted geological studies of the area; now starts the phase to analyze how to drill it”. In summary, in 2005, the tunnel profits of a real boost: the investment on the project that connects Morocco to Europe was increased tenfold, even if it is inferior to the 27 millions previously committed. I have found no public information that could explain this lower budget. Drilling of the service tunnel. To be done as soon as the initial technical plan is drafted. The data gathered while drilling this tunnel will allow to fine tune the railway tunnel project, reducing technical and budget risks. Drilling of one of the railway tunnels. While this tube is drilled, Morocco and Spain will work on the surface railway. Drilling of the second railway tunnel. If the traffic of the first tunnel confirms that a second one is needed. Click on this text to enlarge. “It’s an unprecedented challenge as regards the construction of major infrastructures, in the limits of technical feasibility”. “By comparison, the English Channel was a child’s game (…) its depth and the water pressure is much smaller, ocean currents are weaker and the rock is more solid”. It seems that the tunnel will be a technical challenge indeed, Moreover, for some reason Lombardi has failed to mention a most concerning issue: The tunnel will cross an active fault of the African and the Eurasian tectonic plates, with a moderate seismic risk. I wonder whether some reader could tell me more about this issue. The technical studies by Lombardi were supposed to be finished in one year, but I have found no update. In any case, the project goes on with the full political support from Spanish government. In August 2007, in the frame of the Africa-Europe Summit held in Lisbon, the Spanish Foreign Minister confirmed the “determination” of both countries to have the tunnel in operation by 2025 at the latest. He declared that “Morocco and Spain are the two connecting countries, the two links of the chain needed to bring together both continents”. I have also found this article in the WaPo (A ‘Chunnel’ for Spain and Morocco), which includes some statemnts by Karim Ghellab, Morocco’s minister of transportation: “It’s not easy to predict a date yet, but it is a project that will happen.”. Also to note: “It will completely change our world”. I am not sure it will change Morocco, but of course it would indeed change Spain, not necessarily for good. Zapatero and Mojamé VI, present the new map of Morocco. What percentage of passengers and cargo traffic will continue to ferry when the tunnel starts operating? Will the tunnel attract passengers who used to travel to Morocco or Algeria from Almeria, Alicante or even Sète (France)? Last year  Eurotunnel had 16 million passengers. The forecasts, not yet very accurate, suggest that the tunnel of the Strait will reach only half of that traffic in 2015, if it was then opened. Ten years later it would reach around 10 million. Passenger traffic in the Strait is also highly concentrated in the summer months, when nearly three million immigrants Moroccans returning by car to his country on vacation. The answer to questions about increased traffic depends largely on political considerations. If Algeria reopens its border with Morocco, closed since 1994, and if the two heavyweights Maghreb improve cross-border road, the tunnel will be more viable from an economic standpoint. Now, this tunnel, which is much more challenging technically, cannot be cheaper than the Channel one; the 13 billion must include only some initial phase. If the Channel Tunnel, less challenging and with more traffic, has experienced large financial troubles and has been on the edge of bankruptcy, it is not difficult to conclude that the Strait Tunnel cannot be financially viable. There is one way out: getting political support, and Morocco –the main beneficiary- is playing its cards masterly: Morocco has involved France in the business. In autumn 2007, it has started to plan for a high speed rail network. This plan has no sense if the railway network was not connected to Spain; i.e. if there is no tunnel. Alstom and other French companies will build the high speed railway; a contract of EUR 3000 million. The allocation to the French companies has been decided at the highest level (by the King Mohamed VI), no international tendering process will be followed. Spanish companies have not even been invited, even if they also have the expertise and are currently building the Spanish high speed railway network. No need. Zapatero had already announced in his visit to Rabat in March 2007 that he is firmly decided to give a boost to the tunnel, so what. Sarkozy will host a high level meeting on the Euro –Mediterranean Union next July, just before the national holiday that celebrates the take over of the Bastille, a privileged prison for aristocrats that had only two prisoners. I can envisage that this will be one of the most visible projects connected to that Union. Is there any way to stop the tunnel? I do not know, but if there is one, it will be the financial aspect: without the financial support from the EU, the tunnel will not be built. This is the weakest point of the chain, the one to broken. In any case, in 2025, when the tunnel could be in operation, the fate of Europe will have already been decided. Tratamiento a la vista para el Parkinson tras investigación con células madre adultas.